Grow BI is positioned as an easy-to-use, business oriented visual BI platform implemented as a cloud service. It is not a particularly sophisticated product, and does not compete with the likes of Tableau or Qlik. Small to medium size businesses will find it does most of what they need, provided the requirements are not too demanding, and it distinguishes itself by supporting unlimited users regardless of subscription level. The simplicity of the platform and the large number of data integrations means most businesses will be up and running very quickly. This is aided by the fact that Grow also provides a large number of pre-built reports. Particular support is provided for sales and marketing functions, but others are also catered for. Business oriented with many pre-built reports. Unlimited users for all subscription levels. Data refreshes every 5 minutes if needed. Lacking sophistication for complex requirements. Users report that some data integrations can be glitchy. User interface lacks customization features (fonts and font sizing are a particular frustration). Data uploads can be slow for large data volumes. 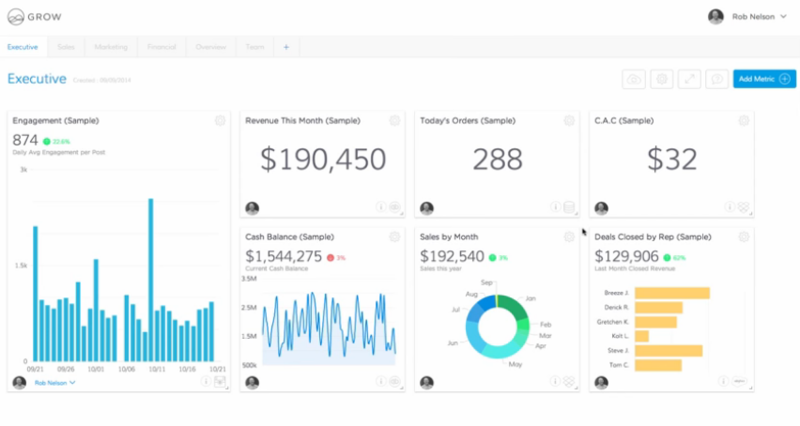 Like all products of this nature, Grow provides a graphical environment to create charts and dashboards. This is mainly menu driven with the ability to drag and drop various artifacts as needed. For simple to moderate needs this is all that will be needed. Greater sophistication can be gained through coding in SQL. The large number of data integrations (over 150) include all popular web services, files, databases, and Excel data. Users can use a time window to scroll back in time and view historical performance, and data updates can be scheduled for any time period down to 5 minutes. A large number of pre-built reports support a variety of business functions, including finance, operations, sales and marketing. Reports can be distributed as PDF documents, and this process can be automated as desired. All the security and management tools that are needed in an environment of this nature are provided. 1. Executive – sales vs quota, rep performance, cash balance, growth rate etc. 2. Marketing – Inbound leads, conversion rates, cost per lead, website metrics etc. 3. Finance – burn rate/runaway, net income vs forecast, current ratio etc. 4. Operations – NPS score, employee productivity, COGS, etc. 5. Sales Management – pipeline, deals closed, average deal size, sales funnel conversion etc. 6. Sales leaderboards and reports for investors are also provided. The natural competitors for Grow BI are the likes of Chartio and Domo – both of which are much more expensive. 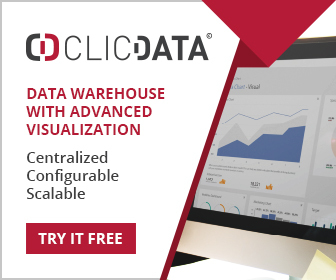 Businesses might also consider looking at the pure-play dashboard platforms such as ClicData, or if needs are likely to be sophisticated then platforms such as Tableau, Qlik and Sisense should be considered.